VANCOUVER – The Port of Vancouver has become so congested with freight from China that importers — including major retailers — are bypassing the West Coast and docking in Halifax. The journey from Asia takes at least twice as long but shippers and their customers are trying to avoid the traffic snarls on Vancouver’s docks and rail lines that can tie up goods for up to two weeks. “A lot of the major importers have been lobbying carriers to provide East Coast service,” said Bernie Dumas, general manager of sales and marketing in Canada for China Shipping Co., one of the biggest global transport companies. Mr. Dumas said the top retailers, such as The Bay, Wal-Mart Canada Corp. and Canadian Tire Corp., have all added the Port of Halifax to their supply lines. Times vary, but most shippers can move a container from Shanghai or Hong Kong to Vancouver in about two weeks. 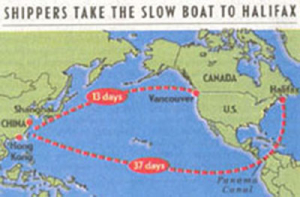 If they bypass Vancouver and head for Halifax via the Panama Canal, the journey can take anywhere from a month to 37 days. Shippers declined to talk about actual costs, but Mr. Dumas said the Halifax route is about 35% more expensive. During the past year, ports up and down the West Coast, from Vancouver to Los Angeles, have been swamped with a massive increase in trade from developing countries in Asia, especially China. The increased flow has overloaded not only the ports but also railways and trucking firms, creating unprecedented gridlock and delays, a situation that is already taking a toll on the retail industry. A spokeswoman for Jean Lapierre, the Minister of Transport, said he is aware of the problem but is limited in what he can do given the port is run by an independent, not-for-profit authority. About a half-dozen shipping lines have introduced a Halifax stop for their Far East routes, including China Shipping, Zim Integrated Shipping Services Ltd. and Hapag-Lloyd. Vancouver is the biggest port in Canada and one of the biggest in North America, handling about $30-billion worth of trade a year. When the system is working, it takes about three weeks to move a container from Shanghai to Toronto or Montreal. But some importers says it is taking more than twice as long, primarily because of delays moving freight out of Vancouver and on to rail cars. The problem has affected a swath of industries that rely on smooth transportation links. But retailers appear to be the the first to experience disruption. Observers say that is because of their increasing reliance on suppliers in places such as China, and a common industry practice of putting in orders just before merchandise is needed. Observers say freight volumes between North America and China began increase dramatically about two years ago but they skyrocketed this year. Vancouver’s port has experienced a 56% increase and the growth is expected to continue for the next few years. Canadian National Railway Co. and CP Rail, say their networks are running smoothly. In a recent interview, Mark Hallman, a spokesman for CN, said any delays at the western end are mainly the responsibility of the shipping lines and terminal operators. But according to TSI Terminal Systems Inc., the biggest container terminal operator, the railways are to blame. Morley Strachan, TSI’s vice-president of business development and strategic planning, said there is a two-week backlog of containers waiting to be loaded on to rail cars.